This Campus is located at Vishal Khand, Gomati Nagar, Lucknow. It was established in the year 1986. It is located on a piece of land admeasuring 10 acres on which the buildings with built up area of about 7964 sq. mtr. are constructed.In addition to the main building, this campus also has Boys’ Hostel with 58 rooms, Girls’ Hostel having 19 rooms and also 9 units of Staff Quarters. It offers research programme leading to the degree of Vidyavaridhi (Ph.D.), professional programme Shiksha-Shastri(B.Ed.) and runs courses in Vyakarana, Sahitya, Bauddh Darshan, Jyotisha ,Ved at Acharya(PG), Shastri (UG) and Prak Shastri (Intermediate) levels. 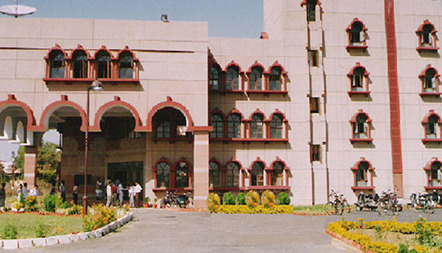 Modern subjects such as Hindi, English, Political Science, Economics and Computer Education are also taught along with the traditional subjects in Prak Shastri and Shastri courses. There is a spacious playground in this campus with Gymnasium. The campus has library facility with traditional and modern books. In Shiksha-Shastra Department education psychology lab is equipped with modern psychological tests and apparatus, Educational technology lab is equipped with various technological and multimedia devices. Centre for Pali studies has been functioning in this Campus since 2009-2010. Pali Centre also provides different certificate courses of Pali, Prakrit and Bhot languages. There is a Distance Education Centre called as Svadhyay Kendra of Muktasvadhyaya Peetham, New Delhi.